For the Coptic Pope, see Pope Tawadros II of Alexandria. Tewodros II (Ge'ez: ቴዎድሮስ, baptized as Sahle Dingil, English: Theodore II; c. 1818 – April 13, 1868) was Emperor of Ethiopia from 1855 until his death in 1868. He was born Kassa Hailegiorgis (Ge'ez: ካሳ ኃይሉ; English: "restitution" and "His [or the] power"). His rule is often placed as the beginning of modern Ethiopia, ending the decentralized Zemene Mesafint (Era of the Princes). Tewodros II's origins were in the Era of the Princes, but his ambitions were not those of the regional nobility. He sought to reestablish a cohesive Ethiopian state and to reform its administration and church. He sought to restore Solomonic hegemony, and he considered himself the Elect of God. Tewodros II's first task was to bring Shewa under his control. During the Era of the Princes, Shewa was, even more than most provinces, an independent entity, its ruler even styling himself Negus, a royal title denoting monarchy. In the course of subduing the Shewans, Tewodros imprisoned a Shewan prince, Menelik II, who would later become emperor himself. Despite his success against Shewa, Tewodros faced constant rebellions in other provinces. He ultimately committed suicide at the Battle of Magdala, during the British Expedition to Abyssinia. In the first six years of his reign, the new ruler managed to put down these rebellions, and the empire was relatively peaceful from about 1861 to 1863, but the energy, wealth, and manpower necessary to deal with regional opposition limited the scope of Tewodros's other activities. Tewodros II never realized his dream of restoring a strong monarchy, although he took many important initial steps. He sought to establish the principle that governors and judges must be salaried appointees. He also established a professional standing army, rather than depending on local lords to provide soldiers for his expeditions. He introduced the collection of books in the form of a library, tax codes, as well as a centralized political system with respective administrative districts. He also intended to reform the church but he was confronted by strong opposition when he tried to impose a tax on church lands to help finance government activities. His confiscation of these lands gained him enemies in the church and little support elsewhere. Essentially, Tewodros was a talented military campaigner. Kassa was the son of a Christian nobleman of the Qwara district of the province of Dembiya named Hailegiorgis Woldegiorgis. His paternal grandfather, Dejazmatch Woldegiorgis, was a widely respected figure of his time. Dembiya was part of the large territory known as Ye Maru Qemas, or "the taste of the honey". It was the personal fief of Dejazmach Maru, a powerful warlord, and relative of Kassa Hailu (possibly a half-uncle). Kassa's mother, Woizero Atitegeb Wondbewossen, was of the upper nobility, and was originally from Sayint (Wollo). Her mother Woizer Tishal was a member of a noble family of Begemder, while her paternal grandfather, Ras Wodajo, was a powerful and highly influential figure. Tewodros II, in his reign, claimed that his father was descended from Emperor Fasilides by way of a daughter. When Kassa was very young, his parents divorced and Woizero Atitegeb moved back to Gondar taking her son with her. Not long after their departure, news reached them that Kassa's father had died. Popular legend states that Kassa's paternal relatives split up the entire paternal inheritance, leaving young Kassa and his mother with nothing and in very dire circumstances financially. In these hard times, his enemies came with a saying that his mother, Woizero Atitegeb, was reduced to selling "Kosso", a native herbal remedy used to purge patients of intestinal worms (a common occurrence because of the Ethiopian love of raw beef steaks). There is actually no evidence that Woizero Atitegeb was ever a Kosso seller, and several writers such as [Paulos Ngo Ngo] have stated outright that it was a false rumor spread by her detractors. Evidence indicates that Woizero Atitegeb was fairly well to do, and indeed had inherited considerable land holdings from her own illustrious relatives to lead a comfortable life. Kassa's youth was probably not lived lavishly, but he was far from a pauper. Kassa was sent to school at the convent of Tekla Haymanot, between Gondar and Lake Tana. In this asylum he took refuge until it was sacked by a defeated Galla chief named Dejazmatch Maru, who by burning and cutting to pieces children, took cowardly vengeance on their victories parents! Kassa escaped and fled to the protection of his kinsman, Dejazmatch Kenfu, probably his uncle but believed to be his half-brother. He continued his formal education and became familiar with the Bible and Ethiopian literature. For his time, Kassa was a well-educated man; later he went on to acquire a knowledge of both ancient and modern European history, as well as some acquaintance with Shakespeare. He also received instruction on the techniques of Ethiopian warfare from Kenfu. When Kenfu died, and his two sons were defeated by another Dajazmach (earl), Dajazmach Goshu of Damot and Gojjam, Kassa was forced to make another start in life, and offered his services to Goshu. Kassa Hailu was born into a country rife with civil war, and he defeated many regional noblemen and princes before becoming emperor during time known as the Zemene Mesafint or "Age of the Princes". During this era, regional princes, and noble lords of diverse ethnic and religious backgrounds vied with each other for power and control of the Gondarine Emperor. A puppet Emperor of the Solomonic dynasty was enthroned in Gondar by one nobleman, only to be dethroned and replaced by another member of the Imperial dynasty when a different regional prince was able to seize Gondar and the reins of power. Regions such as Gojjam and Shewa were ruled by their own branches of the Imperial dynasty and, in Shewa, the local prince went as far as assuming the title of King. In Wollo, competing royal powerful Oromo and Muslim dynasties also vied for power. Nevertheless, a semblance of order and unity was maintained in northern Ethiopia during the era of the Princes by the powerful rases of the Were Sheik dynasty of Wollo such as Ras Ali the Great and Ras Gugsa who controlled Gondar and the Emperor. Kassa began his career in this era as a shifta ( outlaw), but after amassing a sizable force of followers, was able to not only restore himself to his father's previous fief of Qwara but was able to control all of Dembiya. Moreover, he gained popular support by his benevolent treatment of the inhabitants in the areas he controlled: according to Sven Rubenson, Kassa "shared out captured grain and money to the peasants in Qwara and told them to buy hoes and plant." This garnered notice of the nobleman in control of Gondar, Ras Ali II of Yejju of Wollo. Empress Menen Liben Amede, wife of Emperor Yohannes III, and the daughter of Ras Ali arranged for Kassa to marry her granddaughter, Tewabech Ali. She awarded him all of Ye Meru Qemas in the hopes of binding him firmly to her son and herself. Although all sources and authorities believe that Kassa truly loved and respected his wife, his relationship with his new in-laws deteriorated largely because of the disdainful treatment he repeatedly received from the Empress Menen. By 1852, he rebelled against Ras Ali and, in a series of victories — Gur Amaba, Takusa, Ayshal, and Amba Jebelli — over the next three years he handily defeated every army the Ras and the Empress sent against him. At Ayshal he captured the Empress Menen, and Ras Ali fled. Kassa announced that he was deposing Emperor Yohannes III, and then marched on his greatest remaining rival, Dejazmach Wube Haile Maryam of Semien. Tewodros refused to acknowledge an attempt to restore the former Emperor Sahle Dengel in the place of the hapless Yohannes III who had acknowledged Tewodros immediately. Yohannes III was treated well by Tewodros who seems to have had some personal sympathy for him. His views on Sahle Dengel are not known but are not likely to have been sympathetic. Following the defeat of Dejazmach Wube, Kassa was crowned Emperor by Abuna Salama III in the church of Derasge Maryam on February 11, 1855. He took the throne name of Tewodros II, attempting to fulfill a prophecy that a man named Tewodros would restore the Ethiopian Empire to greatness and rule for 40 years. Kassa was very close to Tawabach and devoted to his marriage but his submission to Empress Menen was short-lived. In October 1846, he attacked and plundered Dembea, a city located due south of Gondar, and in January 1847 he went on to occupy Gondar. When Kassa unoccupied Gondar later that year, Empress Menen sent an army after him into north of Lake Tana. Kassa easily defeated the army and took the Empress as prisoner (Marcus 2002, 60). Her son, Ras Ali of Begemder, chose to negotiate with Kassa; he gave Kassa all lands west and north of Lake Tana and Kassa in return released his mother (Prouty and Rosenfeld 1982, 60). The reconciled relationship with Empress Menen led him to join up with Ras Ali and Ras Goshu Zewde of Gojam. However, when conflict re-emerged yet again in 1852, Kassa retreated back to Qwara to re-strengthen his troops. Tewodros giving audience, surrounded by lions. Tewodros sought to unify and modernise Ethiopia. However, since he was nearly always away on campaign during his tenure as emperor, disloyal leaders frequently tried to dislodge him while he was away fighting. Within a few years, he had forcibly brought back under direct Imperial rule the Kingdom of Shewa and the province of Gojjam. He crushed the many lords and princes of Wollo and Tigray and brought recalcitrant regions of Begemder and Simien under his direct rule. He moved the capital city of the Empire from Gondar, first to Debre Tabor, and later to Magdala. Tewodros ended the division of Ethiopia among the various regional lords and princes that had vied among each other for power for almost two centuries. He forcibly re-incorporated the regions of Gojjam, Tigre, Shewa and Wollo under the direct administration of the Imperial throne after they had been ruled by local branches of the Imperial dynasty (in Gojjam and Shewa) or other noblemen (Wollo). With all of his rivals apparently subdued, he imprisoned them and their relatives at Magdala. Among the royal and aristocratic prisoners at Magdala was the young Prince of Shewa, Sahle Mariam, the future Emperor Menelik II. Tewodros doted on the young prince, and married him to his own daughter Alitash Tewodros. Menelik would eventually escape from Magdala, and abandon his wife, offending Tewodros deeply. 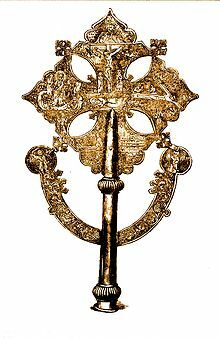 The Cross of Emperor Tewodros II. The death of his beloved wife, Empress Tewabech, marked a deterioration in Tewodros II's behavior. Increasingly erratic and vengeful, he gave full rein to some of his more brutal tendencies now that the calming influence of his wife was absent. For instance, after the murder of the English traveller, John Bell, who had become the emperor's close friend and confidante, the emperor, in revenge, had 500 prisoners beheaded in Debarek. Then, in February 1863, after defeating the rebel, Tedla Gwalu, Tewodros ordered the killing of the 7,000 prisoners he had taken. Tewodros II remarried, this time to the daughter of his imprisoned enemy Dejazmatch Wube. The new Empress, Tiruwork Wube was a proud and haughty woman, very aware of her illustrious Solomonic ancestry. She is said to have intended on the religious life and becoming a nun, especially after the fall of her father and his imprisonment along with her brothers at the hands of Tewodros II. However, Tewodros' request for her hand in marriage was seen by her family as an opportunity to get Dejazmatch Wube and his sons freed from imprisonment, and so they prevailed on her to marry the Emperor. However, while the conditions of their imprisonment were eased, Dejazmatch Wube and his sons were not released, deeply imbittering Empress Tiruwork against Tewodros. Already feeling that she had married far beneath her dignity to a usurper, the failure of the Emperor to free her family did not help their marital relationship. The marriage was very far from a happy one, and was extremely stormy. They did have a son, Dejazmatch Alemayehu Tewodros, whom the Emperor adored and whom he regarded as his heir. By October 1862, Emperor Tewodros' position as ruler had become precarious, much of Ethiopia was in revolt against him, except for a small area stretching from Lake Tana east to his fortress at Magdala. He was engaged in constant military campaigns against a wide array of rebels. Likewise, Abyssinia was also threatened by the encroachment of Islam as Muslim Turks and Egyptians repeatedly invaded Ethiopia from the Red Sea and from Sudan while the Muslim Galla (Oromo) tribe was expanding throughout Central Ethiopia. Tewodros wrote a letter to Queen Victoria as a fellow Christian monarch, asking for British assistance in the region. Tewodros asked the British Consul in Ethiopia, Captain Charles Duncan Cameron, to carry a letter to Queen Victoria requesting skilled workers to come to teach his subjects how to produce firearms, and other technical skills. Cameron traveled to the coast with the letter, but when he informed the Foreign Office of the letter and its contents, the Foreign Office instructed him simply to send the letter to London rather than take it himself. He was to proceed to the Sudan to make inquiries about the slave trade there. After doing this, Cameron returned to Ethiopia. On Cameron's return, the Emperor became enraged when he found out that Cameron had not taken the letter to London personally, had not brought a response from the Queen, and most of all, had spent time traveling through enemy Egyptian and Turkish territories. Cameron tried to appease the Emperor saying that a reply to the letter would arrive shortly. The Foreign Office in London did not pass the letter to Queen Victoria, but simply filed it under Pending. There the letter stayed for a year. Then the Foreign Office sent the letter to India, because Abyssinia came under the Raj's remit. It is alleged that when the letter arrived in India, officials filed it under Not Even Pending. Britain had several reasons for ignoring the letter. The British Empire's interests in Northeast Africa were quite different from those of Tewodros. The English did not want to conduct an Christian "crusade" against Islam but instead to cooperate politically, strategically and commercially with the Ottoman Empire, Egypt and the Sudan. This was not only to protect the route to India but also to ensure that the Ottoman Empire continued to act as a buffer against Russia's plans for expansion into Central Asia. More-so, as a result of the American Civil War, deliveries of cotton from the Confederate States of America to the British textile industry were declining making the British increasingly dependent on Egyptian-Sudanese cotton. The British did not wish to see a conflagration in the region which would upset the status-quo. After two years had passed and Tewodros had not received a reply, he imprisoned Cameron, together with all the British subjects in Ethiopia and various other Europeans, in an attempt to get the queen's attention. His prisoners included a missionary named Mr. Stern, who had previously published a book in Europe describing Tewodros as a barbaric, cruel, unstable usurper. When Tewodros saw this book, he became violently angry, pulled a gun on Stern, and had to be restrained from killing the missionary. He then beat to death the two servants Stern had brought with him. Tewodros also received reports from abroad that foreign papers had quoted these European residents of Ethiopia as having said many negative things about him and his reign. The British sent a mission under an Assyrian-born British subject, Hormuzd Rassam, who bore a letter from the Queen (in response to Tewodros' now three-year-old letter requesting aid). He did not bring the skilled workers as Tewodros had requested. Deeply insulted by the British failure to do exactly as they were told, Tewodros had the members of the Rassam mission added to his other European prisoners. This last breach of diplomatic immunity was the catalyst to Britain launching the 1868 Expedition to Abyssinia under Robert Napier. He traveled from India, then a British colony, with more than 30,000 personnel (a force of 13,000 troops and 26,000 camp followers), which consisted of not only soldiers but also specialists such as engineers. Tewodros had become increasingly unpopular over the years due to his harsh methods, and many regional figures had rebelled against him. Several readily assisted the British by providing guides and food as the expeditionary force marched towards Magdala, where the Emperor had fortified the mountaintop. When the two sides met at Arogye, in the plain facing Magdala, on April 10, 1868, the British defeated the Abyssinian army. With Tewodros' army so decisively defeated, many of his men began to desert and the emperor was left with only 4,000 soldiers. Tewodros II attempted to make peace. Napier responded with a message thanking him for this peace offering and stating that he would treat the Emperor and his family with every dignity. Tewodros II furiously responded that he would never be taken prisoner. 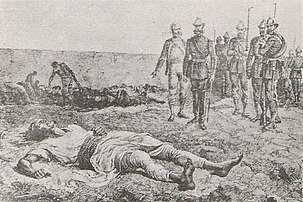 The British shelled Magdala, killing most of Tewodros II's remaining loyal men. Tewodros released all the Europeans unharmed but ordered 300 Ethiopian prisoners to be flung over the cliff. The emperor committed suicide on Easter Monday, April 13, 1868, as the British troops stormed the citadel of Magdala. He has been said to have used a pistol which he had used during fighting for unification during the era, though in reality he used a duelling pistol gifted to him by Queen Victoria and presented by Consul Cameron. Tewodros II was buried by the British troops at Magdala's Medhane Alem (Savior of the World) Orthodox Church under the name of Theodore II. In 2019 the National Army Museum announced the return to Ethiopia of a lock of Tewodros' hair, taken after his death in battle. Magdala was in the territory of the Muslim Gallas (Oromo) tribes who had long ago taken it from the Amhara people; however Tewodros had won it back from them some years before. Two rival Galla queens, Werkait and Mostiat, who had both allied themselves with the British claimed control of the conquered fortress as a reward. However, both Queens could not come to an arrangement and Napier ultimately decided that it would be best to destroy the fortress and consign it to flames. After a thorough medical examination which confirmed Tewodros' death as the result of suicide, the body was dressed and laid out in a hut. By the request of the Emperor's widow, the body was later buried in the Church of Magdala. The British proceeded to loot a vast amount of treasure from the citadel, including Tewodros II's crowns, a huge number of both royal and ecclesiastic robes, vestments, crosses, chalices, swords and shields, many embroidered or decorated with gold or silver, hundreds of tabots, the great Imperial silver negarit war drum, and a huge number of valuable manuscripts. Many of these continue to be held in various museums and libraries in Europe, as well as in private collections. In burning the mountaintop fortress, they also torched the two churches and town. With the Church of Medhane Alem burned, Tewodros II's family later moved the Emperor's remains to the Mahedere Selassie Monastery in his native Qwara, where they remain. The widowed Empress Tiruwork and the young heir of Tewodros, Alemayehu, were also to be taken to England. However, Empress Tiruwork died on the journey to the coast, and little Alemayehu made the journey alone. The Empress was buried at Sheleqot monastery in Tigray among her ancestors. Although Queen Victoria subsidised the education at Rugby of Dejazmatch Alemayehu Tewodros, Captain Tristam Speedy was appointed as his guardian. He developed a very strong attachment to Captain Speedy and his wife. However, Prince Alemayehu grew increasingly lonely as the years went by, and his compromised health made things even harder. He died in October 1879 at the age of 19 without seeing his homeland again. Prince Alemayehu left an impression on Queen Victoria, who wrote of his death in her journal: "It is too sad! All alone in a strange country, without a single person or relative belonging to him... His was no happy life". Emperor Tewodros II had an elder son born outside of wedlock, named Meshesha Tewodros. Meshesha was frequently at odds with his father, especially after it was learned that he had assisted Menelik of Shewa in his escape from Magdala. When Menelik became Emperor of Ethiopia, Meshesha Tewodros was raised to the title of Ras and given Dembia as his fief. Ras Meshesha would remain a loyal friend of Emperor Menelik II until his death, and his descendants were regarded as among the highest nobility and the leading representatives of Tewodros' line. Tewodros II's much loved daughter, Woizero Alitash Tewodros, was the first wife of Menelik of Shewa who eventually became Emperor Menelik II of Ethiopia. Woizero Alitash was abandoned by her husband when Menelik escaped from Magdala to return and reclaim his Shewan throne. She was subsequently remarried to Dejazmatch Bariaw Paulos of Adwa. When Menelik II was proclaimed Emperor of Ethiopia at Were Illu in Wollo shortly after the death of Yohannes IV, Woizero Alitash was among the first of the nobility to travel to Were Illu to pay homage to her former husband as the new Emperor. Rumors persist that Alitash and Emperor Menelik may have rekindled their relationship and that Alitash found that she was pregnant by the Emperor in the following months. The rumors continue that upon hearing about this pregnancy of the Emperor's first wife, the childless and barren Empress Taytu Bitul had Alitash poisoned. Yet a different version of these rumors state that she gave birth to a boy and handed him over to a friend to be raised as a common farmer in Shewa. Regardless of the veracity of these rumors, Woizero Alitash Tewodros, daughter of Tewodros II, died within the first few months of the reign of her ex-husband Menelik II. Tewodros II is an ancestor of the famous actor Peter Ustinov. Emperor Tewodros has come to occupy a high regard amongst many Ethiopians. Examples of his influence are seen in plays, literature, folklore, songs and art works (such as a 1974 book by Sahle Sellassie). Emperor Tewodros has come to symbolise Ethiopian unity and identity. Tewodros, under the name Theodore, appears in George MacDonald Fraser's fictionalised account of the 1868 conflict, Flashman on the March, where he is portrayed as a volatile, bloodthirsty madman. Karen Mercury's historical fiction The Four Quarters of the World (Medallion Press, 2006) depicts the rise and fall of Tewodros as seen through the eyes of his European captives, using primary sources from eyewitnesses to create an unbiased portrait of the Emperor. When the Emperor Dies by Mason McCann Smith is another work of historical fiction based around the rise, reign and fall of Emperor Tewodros. Philip Marsden's The Barefoot Emperor chronicles the life and times of Emperor Tewodros's quest for power and his reign. Marsden remarks that Tewodros's violence makes him ambiguous to be a true hero worthy of a bronze statue like Napier in London. Tewodros features prominently in Alan Moorehead's historical survey The Blue Nile. John Pridham composed and published a piano solo piece, "Abyssinian Expedition", commemorating the Battle of Magdala. The digitized (scanned) sheet music can be found at the National Library of Australia's website. ^ a b c d e f g "Tewodros II - emperor of Ethiopia". Archived from the original on 2017-01-07. ^ a b c "The Great Unifier: Emperor Tewodros II of Ethiopia" (PDF). Archived (PDF) from the original on 2007-07-04. Retrieved 2007-06-22. ^ Ghelawdewos Araia. (2006). The Great Unifier: Emperor Tewodros II of Ethiopia Archived 2007-07-04 at the Wayback Machine. Institute of Development and Education for Africa (IDEA), Inc. 1-8. PDF. ^ a b c d e f g Teklehaimanot, Teum. "Ethiopian Treasures - Emperor Tewodros II, Battle of Meqdala - Ethiopia". www.ethiopiantreasures.co.uk. Archived from the original on 2016-12-31. ^ a b c d e f g Molvaer, Reidulf K. (9 February 1998). "The Achievement of Emperor Téwodros II of Ethiopia (1855-1868): From an Unpublished Manuscript by Aleqa Tekle-Ïyesus ("Aleqa Teklé") of Gojjam". Northeast African Studies. 5 (3): 7–79. doi:10.1353/nas.1998.0012. Archived from the original on 10 February 2018 – via Project MUSE. ^ a b c "Emperor Tewodros II – Imperial Ethiopia". www.haileselassie.net. Archived from the original on 2017-01-07. ^ a b c "The Library of Emperor Tewodros II at Mäqdäla (Magdala) on JSTOR". www.jstor.org. JSTOR 613105. ^ Marcus, Harold (1975). The Life and Times of Menelik II: Ethiopia 1844-1913. Oxford: Clarendon Press. p. 13. ^ Rubenson, Sven (1966). King of Kings: Tewodros of Ethiopia. Addis Ababa: Haile Selassie I University. p. 36. ^ Marsden, Philip (2007). The Barefoot Emperor: An Ethiopian Tragedy. London: Harper Collins. pp. 75–76. ^ Marsden, Philip (2007). The Barefoot Emperor: An Ethiopian Tragedy. London: Harper Collins. pp. 84–85. ^ Rassam, Hormuzd (1869). Narrative of the Mission to Theodore, King of Abyssinia. pp. 238–240 vol i. ^ Juterczenka, Sünne (2009). The Fuzzy Logic of Encounter: New Perspectives on Cultural Contact (Cultural Encounters and the Discourses of Scholarship). Waxmann Verlag Gmbh Mrz. ISBN 9783830921240. ^ a b Matthies, Volker (2010). The Siege of Magdala: The British Empire Against the Emperor of Ethiopia. Princeton, New Jersey: Markus Weiner Publishers. ^ Arnold, Percy (1991). Prelude to Magdala: Emperor Theodore of Ethiopia and British Diplomacy. London: Bellew Publishing. pp. 80–81. ^ Blanc, Henry (1868). A Narrative of Captivity in Abyssinia. London. pp. 388–390. ^ Henty, G. A. (1868). The March to Magdala. London. p. 389. ^ Myatt, Frederick (1970). The March to Magdala: The Abyssinian War of 1868. London: Leo Cooper. p. 164. ^ Stanley, Henry M. (1874). Coomassie and Magdala. London: Sampson Low. p. 449. ^ "Tewodros II". Archived from the original on 23 April 2009. Retrieved 22 April 2009. ^ "Ethiopian Emperor Tewodros II's stolen hair to be returned by UK". BBC News. 4 March 2019. Retrieved 4 March 2019. ^ Abdur Rahman Alfa Shaban (4 March 2019). "UK museum to return lock of hair of Ethiopia's Emperor Tewodros II". Africanews. Retrieved 4 March 2019. ^ "AFRICAN KINGS AND QUEENS | Legends of African History | Askia | Sunni Ali Ber| Malcolm X | Nzinga | Garvey". www.africanholocaust.net. Archived from the original on 2016-10-05. Retrieved 2016-10-04. ^ "Ustinov | FRONTLINE | PBS". www.pbs.org. ^ "'Mad king Tewodros' of Abyssinia". Archived from the original on 2016-10-08. Retrieved 2016-10-04. ^ "Music - National Library of Australia". www.nla.gov.au. Archived from the original on 2014-02-11. This page is based on the Wikipedia article Tewodros II; it is used under the Creative Commons Attribution-ShareAlike 3.0 Unported License (CC-BY-SA). You may redistribute it, verbatim or modified, providing that you comply with the terms of the CC-BY-SA.